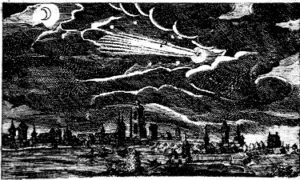 Historically, many have equated the appearance of comets as harbingers of doom. Halley’s Comet was blamed for earthquakes, illnesses and even the Black Death (bubonic plague). How exciting it would have been to witness The Great Comet of 1577 which was as bright as Venus and had a long tail that stretched across the sky forty times the width of the full Moon. I count myself among the fortunate who witnessed Comet Hale-Bopp in 1997, having admired it’s clear tail in the starry skies above Mammoth Mountain in California. This post is not a proclamation or prophetic statement, but it is interesting that NASA has stated that Comet 45P/Honda-Mrkos-Pajdušáková will be visible by the moon in the northern hemisphere on New Years’s Eve, December 31, 2016 as early as 5:15 pm to 5:25 pm the western sky after sunset in the center of Capricorn. 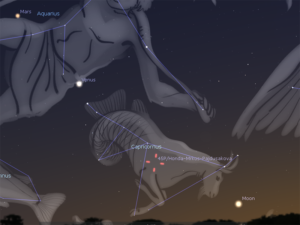 The Moon, Comet 45P, Venus and Mars will all be aligned. Binoculars would be helpful. Another interesting date on which a comet will be in a significant part of the sky is September 23, 2017 which is the beginning of Feast of Trumpets, when the Rosetta Comet (P67) will be right a the foot of Virgo the Virgin, near the Moon. 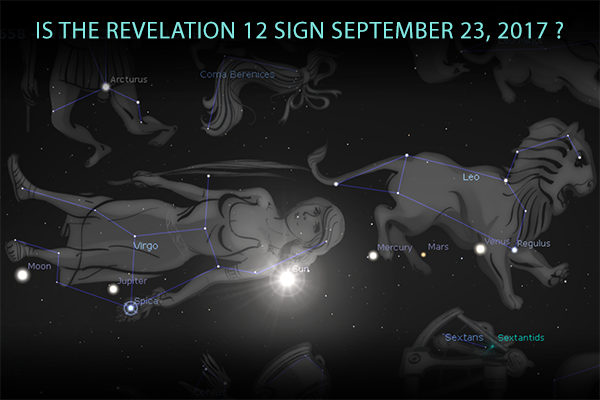 It appears that Rosetta Comet will not be visible, but it will be right there at the very day and hour(s) when what appears to be the Revelation 12 Sign occurs. Coincidence? Is it true that the last time Hale-Bopp passed through the inner solar system, according to the Smithsonian Institute, it was the same year Noah received his orders to build an Ark? If yes, can it be loaded in Stellarium. Was the day that it made its closest pass to earth was March 23, 1997 – the very same Feast Day (Purim) when there was another blood red moon over Jerusalem? Is it true that according to the Jewish Talmud, it is alarming to have a comet pass through the constellation of Orion, which is exactly what Hale-Bopp did? On May 7, 2000, Venus, Mercury, Sun, Jupiter, Saturn, Mars, and the Moon were in a straight line. This is another unique event that has never occurred before! Josephus, in “Antiquities of the Jews,” Book 3, Chapter VII:7, says that these seven represent the menorah (candlestick) in the Temple. This date corresponds to the date when Solomon started to build the first Temple and Ezra started building the second Temple.